I’m behind in blogging! Worth tuned two at the end of February. 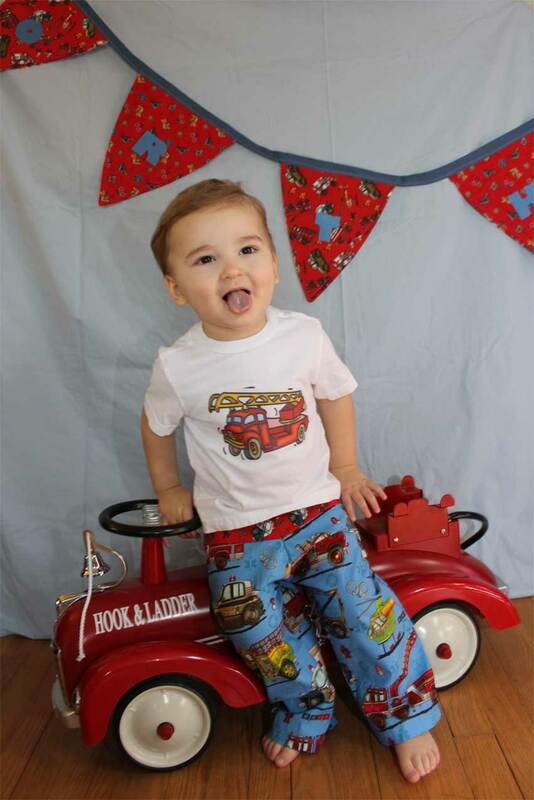 He celebrated in mama-made pants featuring rescue vehicles and a fire truck t-shirt (iron-on transfer paper on an undershirt). I didn’t use a pattern for the pants, just traced around a pair that already fit him well and sliced it in two to make the red contrasting panel on top. I made a banner out of more fire truck fabric and ironed felt letters on the front to spell the birthday boy’s name. After the party I hung the banner in his bedroom window as a personalized year-round decoration. 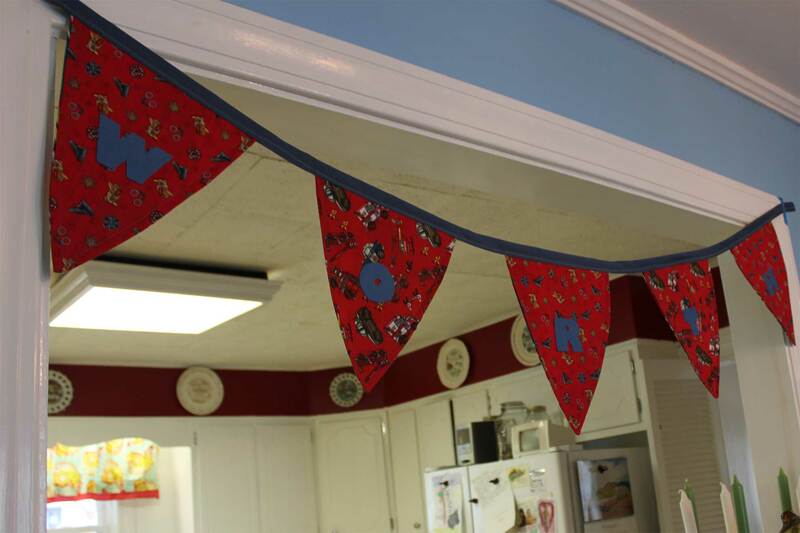 I used a bright outdoor stripe print on the back of the pennants, picked up as a big bargain at a thrift store. Unfortunately the fabric didn’t seem like so much of a bargain after I ironed it and the whole house started to smell like cigarette smoke. Gross! I’d washed it too, but that smell is so persistent. It doesn’t seem to be giving off smells just hanging there, though. Shew. Fabric thrifting gone wrong! Mildly funny that the firetruck banner smells like smoke though. 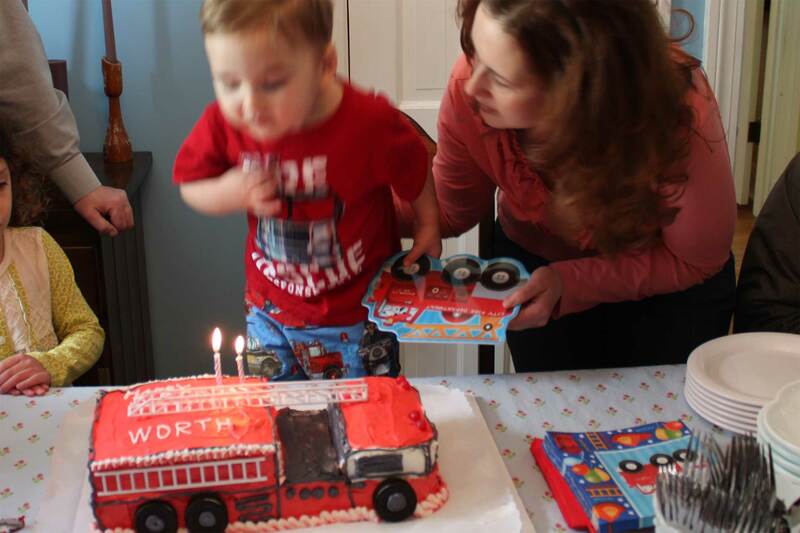 My mom made Worth’s birthday cake in the shape of a fire truck, which he identifies by the sound it makes, “awoooooooo!” I made little gift bags for the cousins out of things I thought firemen might need–lip balm, band-aids and kisses. They didn’t get the connection but I felt clever. I think my little aspiring rescue worker had a good birthday. Your Mom did a great job on the cake…it’s precious! Isn’t it? Nana does good work. 🙂 Thanks!